What to do with our soldiers? Today I attended the East Hampton Memorial Day parade and ceremony. One of the veterans spoke about how Congress has money to allow illegal aliens to become citizens, but doesn't have money that could equip our soldiers with the latest equipment to help keep them safe while in Iraq. I will be the first to admit I don't follow politics and these issues as much as I should. My days are loaded with Internet advertising issues. This veteran's speech struck a cord with me. In the business world if you want to end a project or division, you cut the budget, you redeploy the people or lay them off. You don't take away their safety goggles and tell them to keep using dangerous machinery. You don't close the plant and leave the workers in the plant. What is Congress doing? If we want the troops out take them out. If you want them to stay, let them stay. Either way make sure they have the tools they need. Winding it down safely requires the right equipment, continuing to fight requires the right equipment. Why can't they make the bills simple, they should cover a specific topic or issue. Instead they layer on special interest projects. All of that money could be used to give the troops the right equipment. They could derail or delay the bill. Delaying critical support for the troops. You can either support our efforts in Iraq or you may not. Either way shouldn't we make sure our troops are properly prepared to face the enemy? From my viewpoint the choice to be there vs the choice to properly fund our soldiers are separate issues. Congress and the public should keep them separate. I normally don't like to admit that I read Newsday, but when I'm in the Hamptons at my in-laws I take a gander. The Sunday Money and Careers section Personal Technology columnist Michael Himowitz highlighted the Pew Internet and American Life Project which surveyed 4,001 people and segmented them into 10 groups. I took the quiz and I fell into the Omnivores group - 8% of the population. Members of this group use their extensive suite of technology tools to do an enormous range of things online, on the go, and with their cell phones. Omnivores are highly engaged with video online and digital content. Between blogging, maintaining their Web pages, remixing digital content, or posting their creations to their websites, they are creative participants in cyberspace. You might see them watching video on an iPod. They might talk about their video games or their participation in virtual worlds the way their parents talked about their favorite TV episode a generation ago. Much of this chatter will take place via instant messages, texting on a cell phone, or on personal blogs. Omnivores are particularly active in dealing with video content. Most have video or digital cameras, and most have tried watching TV on a non-television device, such as a laptop or a cell phone. Omnivores embrace all this connectivity, feeling confident in how they manage information and their many devices. This puts information technology at the center of how they express themselves, do their jobs, and connect to their friends. They are young, ethnically diverse, and mostly male (70%). The median age is 28; just more than half of them are under age 30, versus one in five in the general population. Over half are white (64%) and 11% are black (compared to 12% in the general population). English-speaking Hispanics make up 18% of this group. Perhaps unsurprisingly, many (42% versus the 13% average) of Omnivores are students. Take the quiz and post a comment about your classification. Is that a celiac bracelet? Thursday morning I sat in a three seat row on MetroNorth and proceeded to type away on my Blackberry. About halfway into the ride I looked over and noticed the man sitting next to me had a green rubber bracelet. Ever since Lance Armstrong came out with the yellow bracelet there has been a proliferation of rubber bracelets for different causes. Looked again with my 20/15 laser enhanced vision and saw that he was wearing the Celiac Awareness bracelet. I asked him if he was celiac, he wasn't. His young son is celiac. We chatted for a while and he had some good restaurant suggestions in Westchester. What's funny is that my wife always gives me a hard time about wearing the bracelet. I never thought I'd see one on my commute. Diana and I decided to head into the city yesterday to check out the New York Transit Museum in Brooklyn. We had a bit of trouble finding the museum, as we went to the mailing address. Diana and I were directed across the street but expected to see a ground floor entrance. 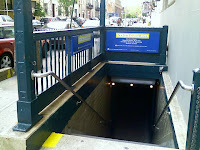 We walked past a subway stairwell which we finally figured out to be the museum. Diana and I spent about three hours walking through the exhibits. They have a great balance between pictures and artifacts along with some hands on experiences. The museum also has an exhibit for the creation of the Triborough bridge and Robert Moses. On a side note: Robert Caro wrote a great book about Robert Moses: The Power Broker: Robert Moses and the Fall of New York. Since the museum is an old subway station, there is a platform where they have all of the old subway cars on display. You could walk through the old cars and they even had old advertisements in the cars. One feature of the old cars that was personally striking to me was the pre-AC cooling systems. 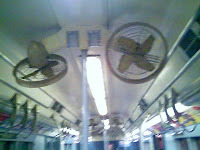 I took a few pictures of the old fans. 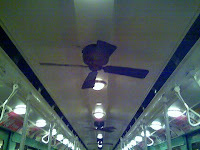 Exposed metal fan blades? That's a lawsuit waiting to happen. Maybe in the past people were smarter - they knew not to put their hands into the spinning metal blades. Or maybe we've become less astute over time as the fans in a future version have cages protecting them. Diana and I highly recommend a visit to this museum. I'm a big fan of Internet radio, I normally listen to AOL Radio through my AIM 6.1 client. Even though I'm a Sirius subscriber, the integration into AIM makes it too convenient not to use it. Normally I hear an occasional commercial, but the other day I heard something highly contextual. I'm making a call to my representative tomorrow. I suggest everyone who listens to Internet radio make the call. Sure it takes some time, but royalties should be fair. Interesting comments regarding culture issues.